Holy Spirit Parish School offers a rich tradition focused on student experience outside the classroom. 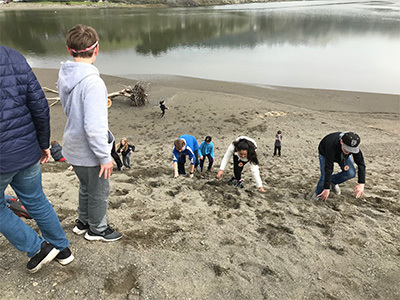 Experiential field trips occur in every grade; however, our 6th, 7th and 8th graders participate in a progressive series of California watershed explorations. 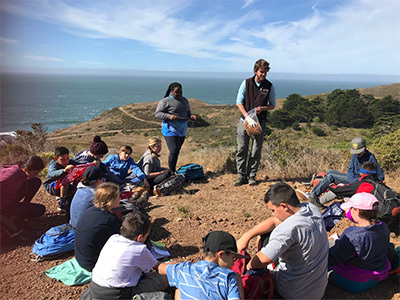 In 6th grade our students explore the Marin Headlands area with Naturebridge. They spend three nights at the Naturebridge campus in the Golden Gate National Monument discovering that the water that passes through Sacramento makes its way to the Pacific Ocean at the mouth of the San Francisco Bay. At this watershed stop, they develop a sense of themselves as responsible actors in the California biome and see themselves as potential problem solvers. They return home transformed by their new sense of independence and responsibility. The following year our students make their way to Westminster Woods located on Dutch Bill Creek, a tributary of the Russian River. Here they find themselves in the middle of a watershed that provides resources for some of California’s great redwood forest. This late winter trip is focused on team challenges, personal responsibility and class bonding. In 7th grade students are finding themselves as young adults and the opportunity to focus on their interpersonal relationships while recognizing the problem solving capacities of their peers gives them a deeper appreciation of the myriad talents that make up a productive responsible Christian. The three year arc culminates at the headwaters of the Yuba River at Donner Summit. Here, under the tutelage of the Gateway Mountain Center, students spend a school week analyzing the health of Norden meadow, collecting data for a UCD longitudinal watershed study, measuring the carbon sequestration capacity of old growth forests, and exploring the cultural history of the area including Indian petroglyphs, Chinese rail workers archeological sites, and folk art in the abandoned rail tunnels. All of this is offset by the opportunity to swim in an high Sierra lake, climb a mountain and wander along the Pacific Crest Trail. Our students bring this experience back to campus with them as they navigate their way toward graduation and new horizons. This California watershed sweep has been a tradition at Holy Spirit Parish School for over 16 years. The locations have changed on occasion but the purpose and outcomes have remained true. Our students can recognize their potential as lifelong learners on these trips and realize their value as stewards of the Earth.